I am happy to announce the addition of custom news sources into Hourly News for iOS! 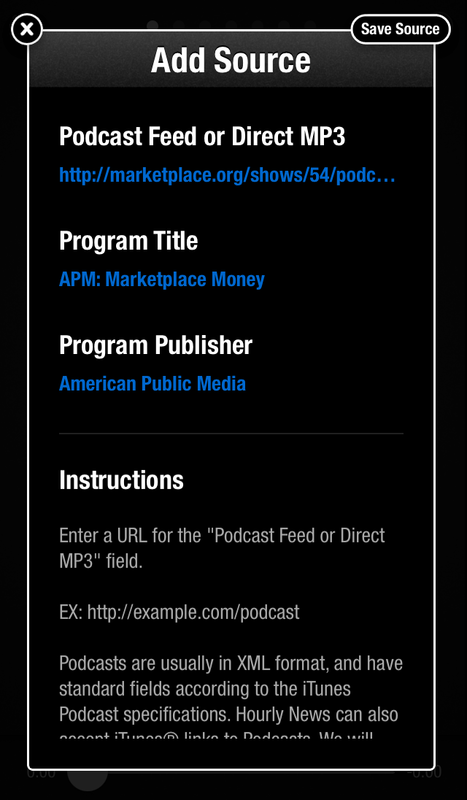 For a one-time, in-app purchase of $0.99, you will be able to add unlimited audio podcasts to the app alongside your other sources. Custom Sources can be re-arranged, skipped, enabled and disabled just like the other ones. Any audio podcast that conforms to the standard podcast format can be added, and Hourly News will do some checking and verifications when you set one up to make sure everything will turn out right. Available today in the latest update to Hourly News, version 1.6.